I met Snow White’s stepmom and Mother Goose. That was more important to me than ascending the Eiffel Tower or looking at impressionist art. 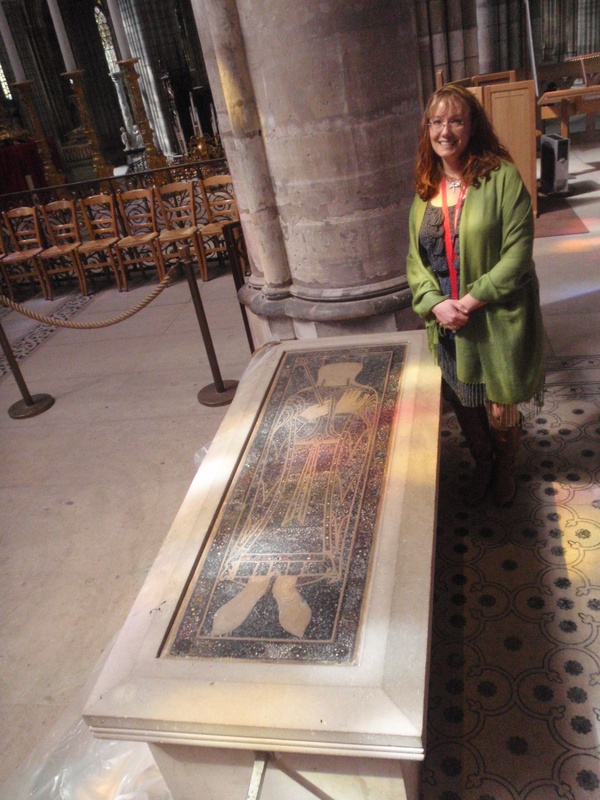 I hung out with “My Girl Fredegund”, THE evil queen that fairy tales tell of. A Merovingian, mother of Charlemagne (who is less a beacon of light in an otherwise chaotic and oppressive age than he is an interruption of the fascinating mayhem of the day). Those crazy Merovingians, they rocked through life without training wheels. They LIVED … perhaps not in the most exemplary manner but they LIVED! And Fredegund she is my favorite of them all, and i “met her”, up close and personal on a Parisan day entirely dedicated to dead people and old stuff. This is one of my biggest takeaways from Paris. 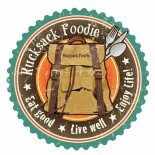 And I did it with the Rucksack Foodie! the west facade and this open space is encroached upon by sprawling tables and chairs from the surrounding cafes. Unlike the other major cathedral squares, this one wasn’t filled with tourists but with with local residents meeting over coffee to discuss the same stuff people discuss over coffee the world over – last nights sporting event and politics. We had to wait at one of these tables to allow a tour group of exuberant school children pass through St. Denis before Rucksack Foodie and I made our pilgrimage to the royal necropolis, and worth the wait it was. with lime). That is a LOT of dead royals. And I love them all. 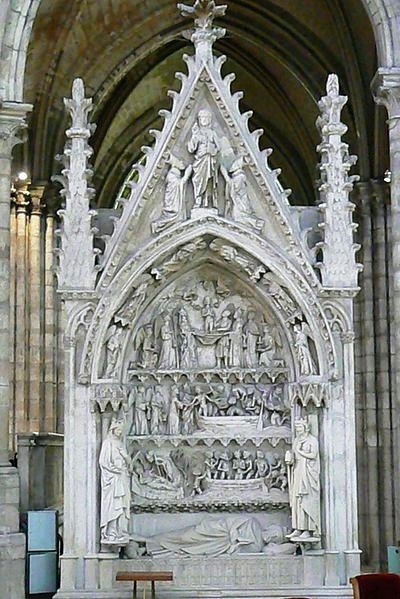 They’re primarily resting in the side aisles and apse of the cathedral, laid out in orderly family groupings with the oldest taking pride of place around the altar and the later monarchs filling the transepts and clustered along both sides of the nave. They’re actually fenced off from the nave so the Halls of the Awesome Dead are a separate destination from the worshipers. And these are some Awesome Dead people. I was giddy like a kid in a candy store at strolling through the orderly tombs with their peaceful recumbent monuments. 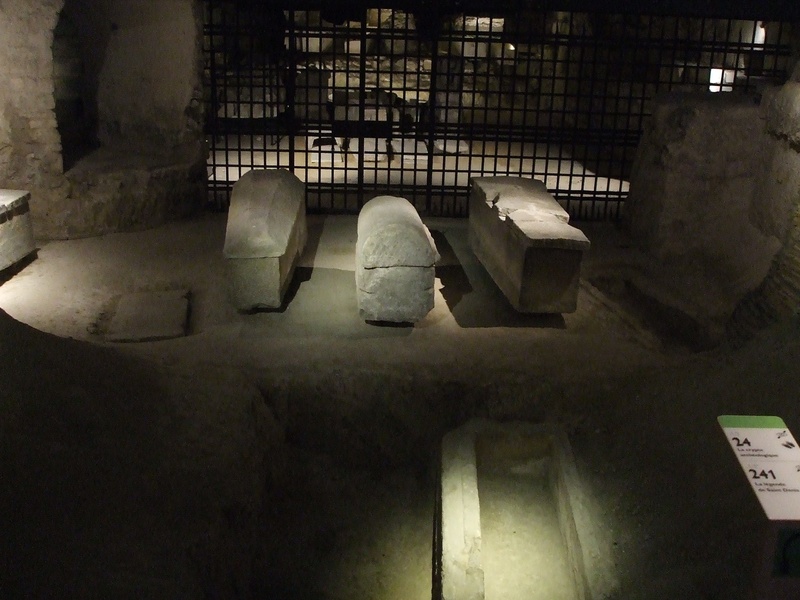 The older sepulchers are not truly representative of their inhabitants but more recent representations,(post 13th Century) are likely to be styled after the inhabitants and it was fascinating to look on their faces and try to spot resemblances in the faces of modern Paris. were all the same family, the old rulers were gathered up and arranged together with their more recent counterparts in one central location – a pretty clever bit of PR, actually – See? We’re all one big happy family! My dad is buried just behind the Martel family! If they were legitimate kings (and who is going to call Charlemagne a usurper?) then so are we! Obviously! – seems legit. By the way, one of those Martel’s is the wife of Pipin the Short, Bertrada of Leon, aka Berthe Big Foot, aka Berthe Goose Foot, aka Mother Goose!! Catherine de Medici, possibly most despicable queen of France. 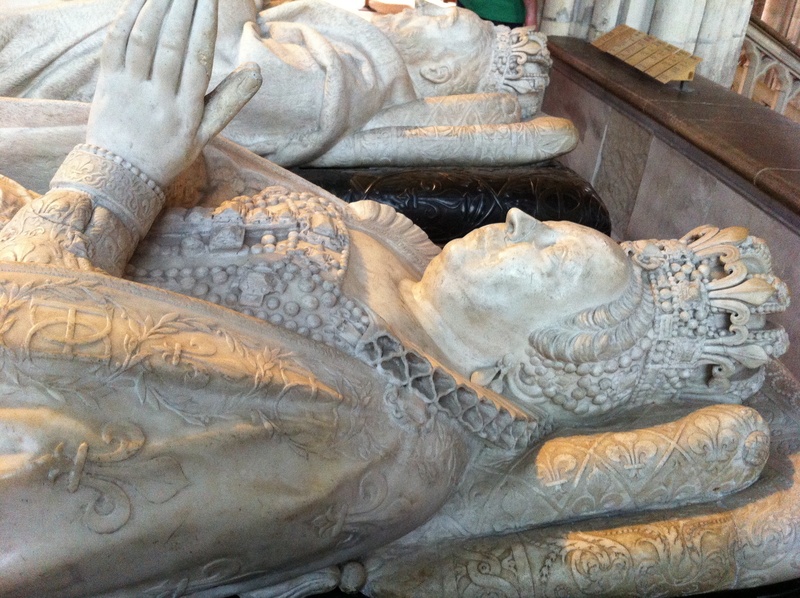 And somewhere in this tangle of tombs was My Girl Fredegund, just waiting for me. It turns out she and her family had the “good seats” just above the altar. 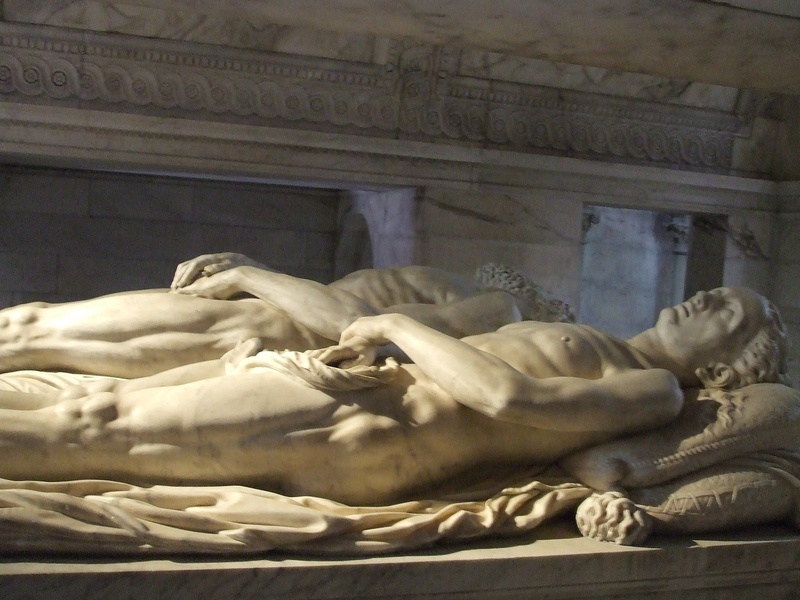 Her grandson Dagobert has a special tomb adjacent to the altar. 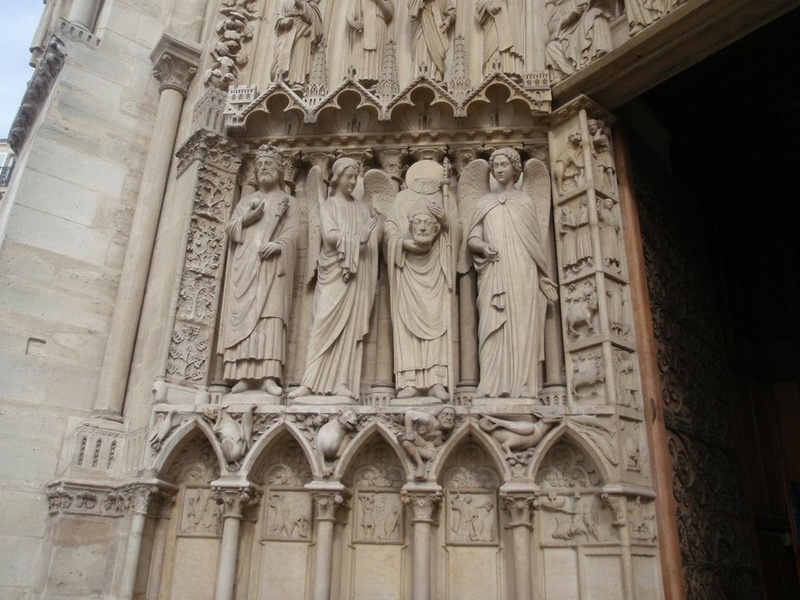 It’s currently being renovated so we couldn’t get a close up look, but there’s a great depiction of the wicked and naughty Dagobert being snatched from the gaping maws of hell just in the nick of time by his conversion (and HUGE gift of gold to St. Denis Cathedral). I’d like to point out that his current wikipedia article lists Dagobert as devoutly pious. This is a modern whitewash – don’t believe it. His contemporary, Gregory of Tours, describes him as a reprobate and hedonist. He kept a flock of concubines and regularly debouched the daughters of his court. Finally we found her, spending her eternity with her husband and father in law, Childebert and Clovis…..wrapped in plastic sheeting! There she was, no velvet ropes, no barricades, just Me, Fredegund, and 2mm plastic sheeting completely obscuring my view of her unique marble & copper inlay monument. (Everyone else in this cathedral has a 3d sculptured efigy which makes it a great place to study medieval clothing, hair and shoes, btw). But Fredegund was all covered up. NooooooOOoooo! I pulled up a chair and sat next to my heroine and her menfolk. An ancient text accounting Brunhilde being torn apart by Fredegund’s son and his men. Revenge is inherited. Fredegund. Fredegund was actually Childebert’s mistress/slave/handmaiden. She convinced him to set aside his current queen in her own favor. 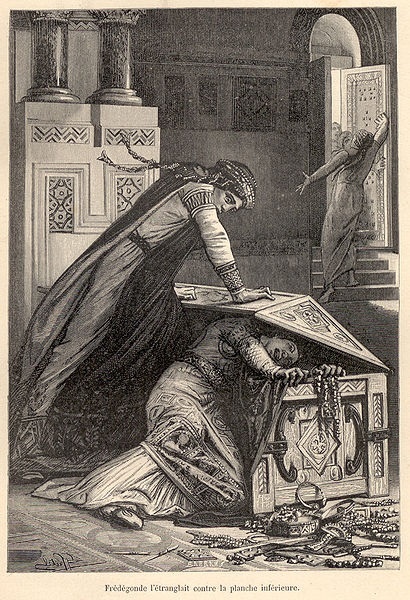 But when Childebert decided to make a political match by marrying the sister of his brother’s new wife in a royal double wedding, Fredegund took matters (and necks) into her own hands and strangled the new Queen, sparking a 40 year feud with the poor dead queen’s sister – Brunhilde. These ladies waged a battle royale that tore through three kingdoms and slew eleven kings. If you’re counting victory by dead kings, Brunhilde wins hands down at 10-1. 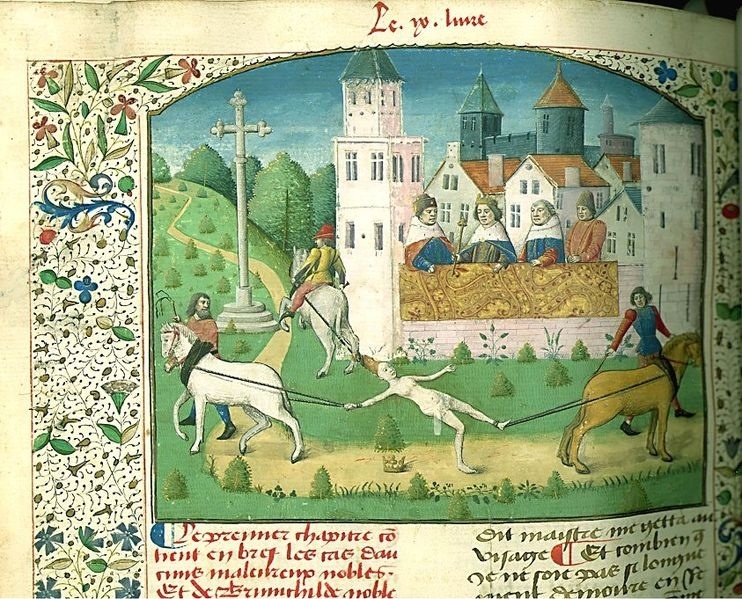 If you’re counting by their ultimate demise, it’s Fredegund by a mile as she died in bed while years later, her son had Brunhilde torn limb from limb by wild horses. 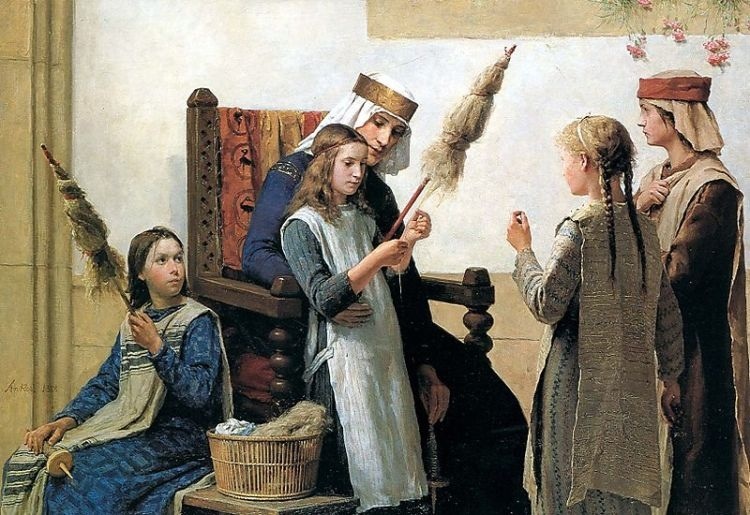 Queen Fredegund (597) here taking care of her stepdaughter, fueled by jealousy and greed. But that’s only part of why I like her. Fredegund is the archetype Evil Queen/Evil Stepmother. She is Cinderella’s stepmother. And Snow White’s. Fredegund became so jealous of her daughter’s beauty and influence with King Childebert that she lured her into the treasure room with the promise of a gift. As soon as she’d maneuvered her daughter into a vulnerable position leaning over an open chest, SLAM! Mother Dearest slammed the lid down on her daughter’s neck. Servants came to investigate the screams and save the princess. Later, when a marriage was arranged for the princess her servants and protectors stole her dowry and deserted her in the wilderness. Does any of this sound familiar? This woman still reaches out to touch us today – we read her stories and watch her in movies. She is the stuff of our fairy tales and our nightmares. She is eternal. And she shares that eternity with Mother Goose, in St. Denis Cathedral in North Paris. cathedral caretaker or… well I’m not sure what her position was. At any rate she came trailing along after RF to greet me with the understanding that I was a Fredegund scholar who had traveled all the way from St. Louis Missouri to research our dear evil queen. So just like that I went from disappointed bystander to all access researcher. 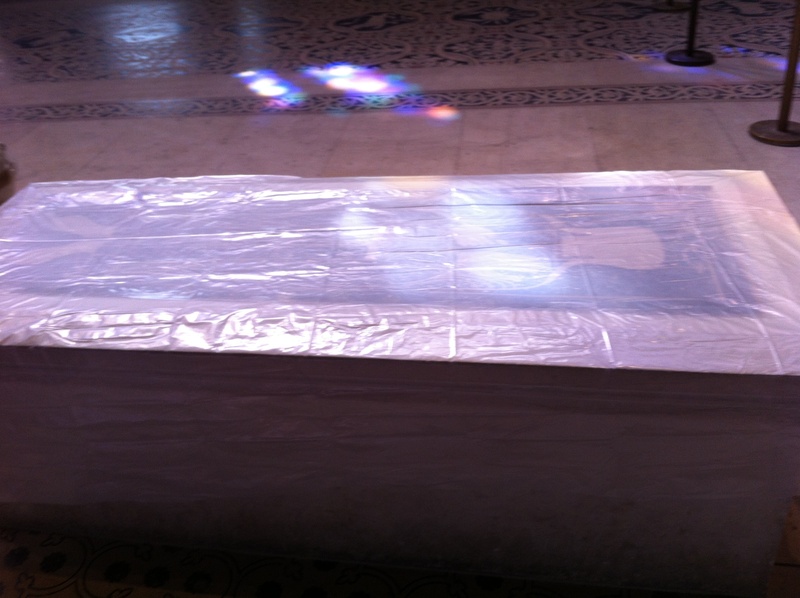 Fredegund’s plastic shroud was carefully removed and then it began: “Why, yes, you can take flash photos. Of course, you may walk around her tomb. Naturally, get as close to the surface as you need…” It was like being an academic rock star. Thank goodness the curator had only broken English so there was no reference to my credentials, though I suppose just being aware of who Fredegund was is credential enough in these circumstances. We talked about her unique effigy, the materials used for her tomb cover, whether her now blank features were painted or etched and subsequently worn away. 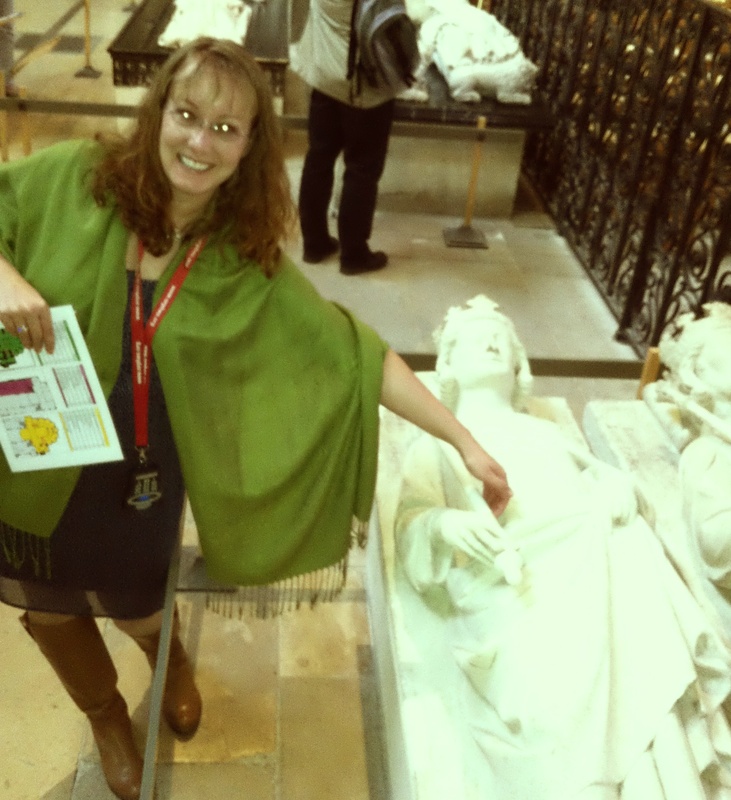 Then I posed for a photo with Fredegund and just like that, my entire trip to Paris was triumphant! The stuff that history and fairy tales are made of! St. Denis Cathedral evolved on the site of a Gallo-Roman cemetery of whom some residents still resides in the bottom most tombs of the cathedral, which are open to the public. 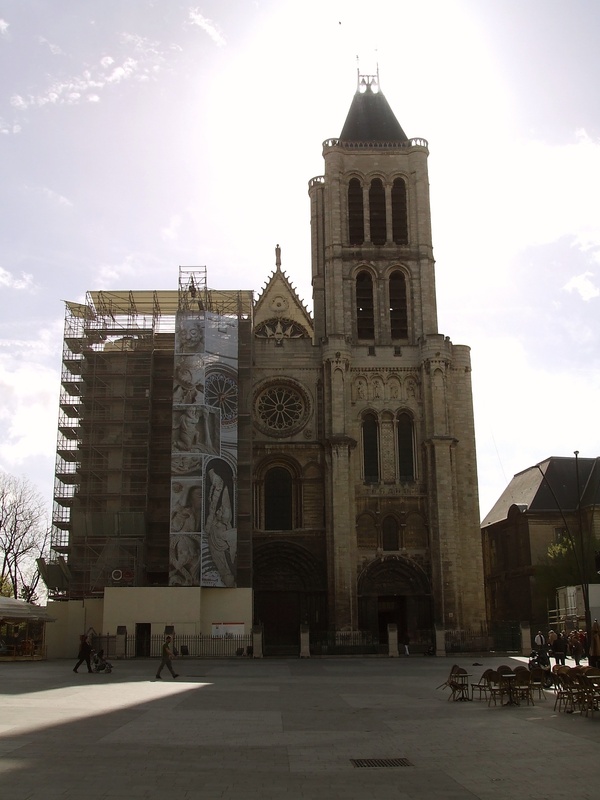 In 475 St. Genevieve constructed the first church on this site with expansion in the 7th century by Dagobert I who was said to have brought St. Denis (one patron saint of France) remains to the site, making it a pilgrimage destination for centuries to come. 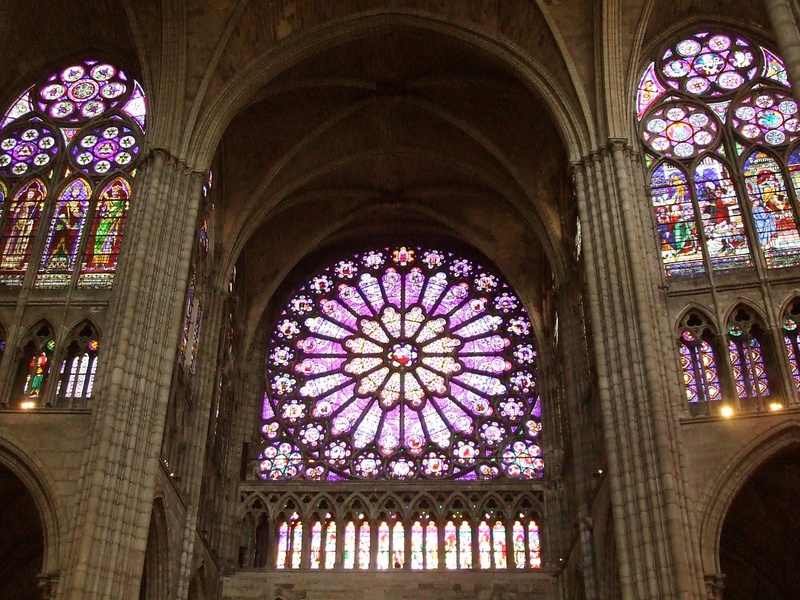 The cathedral, most of what we see today, had construction begun in 1135 and was THE FIRST example of Gothic architecture and the base standard for most all future cathedrals and abbeys in France. 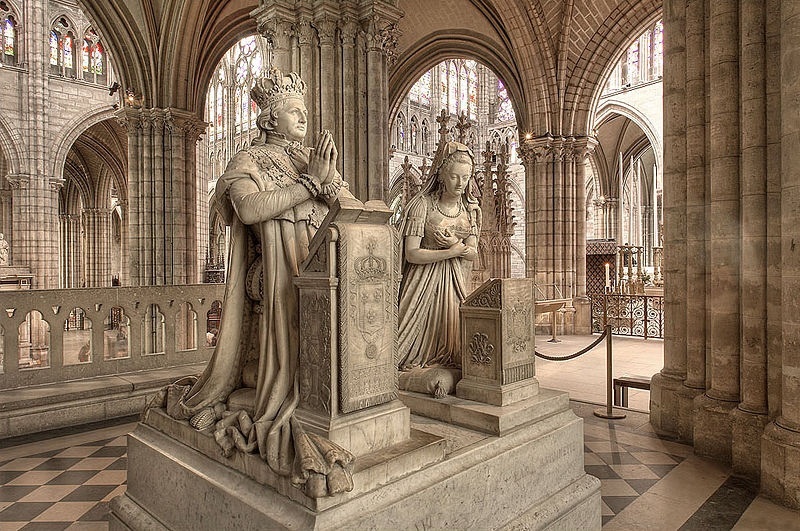 The cathedral is home to almost every king and queen of France from the 10th to the 18th century, with exquisite examples of effigy tombs, stained glass, and gothic architecture. A “must visit” on your next trip to Paris full of interesting and intriguing bits of history even if your not into Awesome Dead People!! St. Denis, murderd/martyred on the Paris Hill of Sacre Couer, is said to risen and walked his headless body, head in hands to this site for the burial he desired. Louis XVI & Marie Antoinette’s effigy in St. Denis, they rest below in the tombs which are accessible to the public. The Parisan Monaco… Via The Rucksack Foodie. I love beer- all levels of quality, taste, thickness, potency. I do not however enjoy Fru-Fru drinks of sweetened concoctions so I was a bit hesitant on trying the Parisian warm day favorite, The Monaco. But I loved it! So simple and could easily consume too much in a party atmosphere. 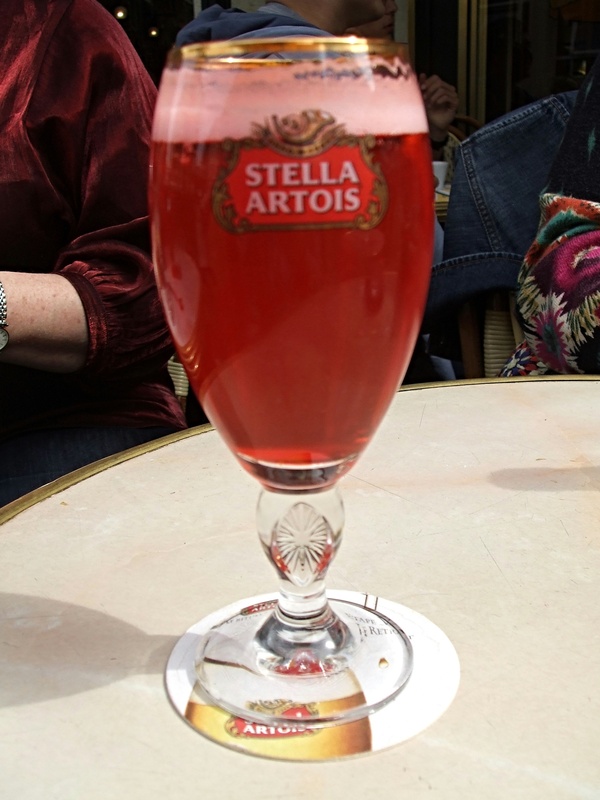 Simply : splash of Grenadine, 1 part lemonade, 2 parts Stella ..viola! I Love, love, love this post! Nice job Lisa, bringing ancient French history to life! Great post, Lisa! I am finally catching up with Cody and her adventures. Inspired! Great post Lisa! Cody, I am finally catching up with your adventures. Inspiring! Thanks so much for reading and following!! 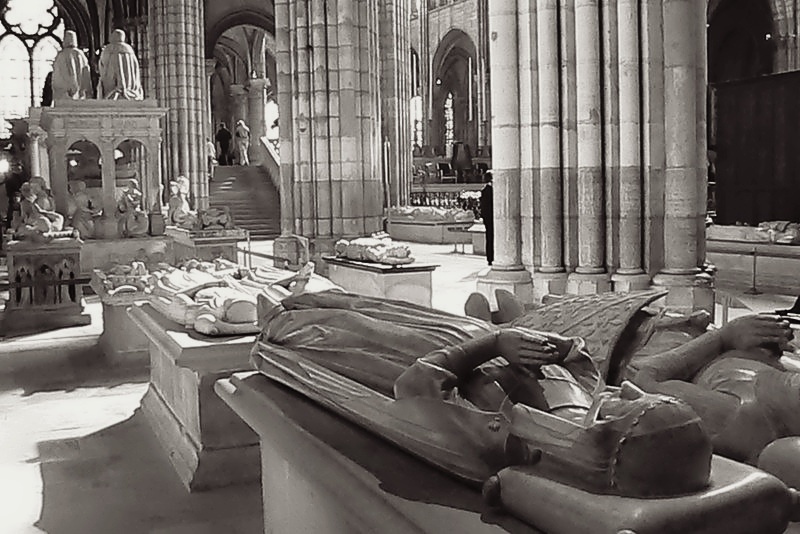 This entry was posted on May 7, 2013 by Rucksack Foodie in Extracurricular, France, Friends, History, Libations, Travel and tagged Bertrada of Leon, effigy tombs, Fredegund, Lisa Glenn, Monaco the drink, Paris, rucksack foodie, St. Denis cathedral.